Coyotes are smart, curious, and adaptable. They live on prairies, in forests, and on farmland. They even live in cities such as Minneapolis, Chicago, and New York. City coyotes might make their homes in parks or in nature preserves or on golf courses—all places where they can find plenty of food and shelter. Sometimes they live in small family groups, and sometimes they live alone. Hungry Coyote by Cheryl Blackford with illustrations by Laurie Caple offers kids a glimpse into the life of an urban coyote as he struggles to feed himself and his famished family. We asked Cheryl and Laurie to share some of their inspiration for the book. “A fondness for nature provides the inspiration behind my artwork. I had the fascinating opportunity to spend time with one of only two known domesticated coyotes in the United States. ’Wiley’ lives with Rick Hanestad and his family in western Wisconsin, about an hour’s drive from St. Paul. A National Geographic film crew recently spent a number of hours documenting his behavior. The book features projects that celebrate Minnesota’s history and people. It includes crafts at four different skill levels, step-by-step instructions, free templates, and 180 color photos. Imagine soldiers on the Civil War battlefield as you assemble a “housewife” sewing kit like those made by wives and mothers. Re-create the drama of a midwestern tornado when you build an automaton that actually spins, and celebrate the invention of water-skiing with a boat and skier that really glide. Step-by-step instructions carefully guide you to make your own marionette, but it’s up to you to stage the puppet show. The playful miniature scene of a Day of the Dead nicho offers a way to honor a loved one. A woodland hike will provide the twigs and leaves to make a troll. A walking stick in the tradition of folk artist Maurice Carlton inspires you to create art out of what you can find. These projects and more generate hours of fun, not to mention useful pieces you’ll want to share with your family and friends. Rhoda’s Rock Hunt by Molly Beth Griffin with illustrations by Jennifer A. Bell explores a child’s first experience of camping in the the north woods and hiking with her aunt and uncle. Rhoda wants to bring home every beautiful rock she finds. But soon, her pack gets too heavy. Rhoda has to decide what to keep and what to leave behind, if she ever wants to see her soft bed again. Family Fun Day at Mille Lacs Indian Museum Tomorrow! 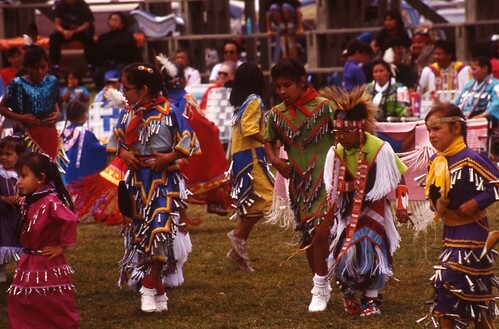 Visit Mille Lacs Indian Museum for a day of fun and games tomorrow! Try and shoot goals with lacrosse sticks, a game that’s growing in popularity today but which has roots in American Indian history. 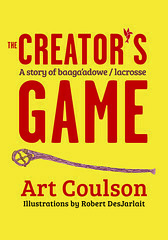 Author Art Coulson and Robert DesJarlait will talk about and sign copies of thier book The Creator’s Game, a children’s story about lacrosse. 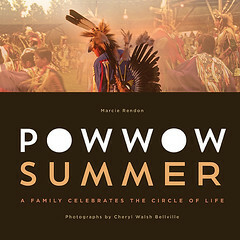 Marcie Rendon will talk about and sign her book Powwow Summer, which follows a family as they travel along the powwow trail. And join artist Cheryl Minnema (Ojibwe Shoulder Bag Kit) as she helps young visitors decorate Ojibwe shoulder bags to take home. 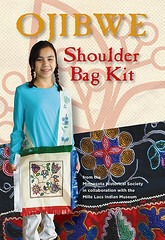 Visit with the authors from 1 to 2 p.m., then join a drum and dance demonstration at 2:30 p.m. This event is free and does not include museum admission. Enjoy free admission on Saturday September 28 from 12 noon to 4:00 pm at the Minnesota History Center during Circles of Tradition Dakota/Ojibwe Family Day featuring speakers and artists from the Dakota and Ojibwe communities who will share traditions of their rich and vibrant history. Visitors can enjoy music, dancing, demonstrations, displays, language exchange, games and art activities. Powwow Summer authors Marcie Rendon and Cheryl Walsh Bellville will share their book, see details, below. This program is offered in conjunction with the Smithsonian Museums Day Live! -an annual free admission event. On Saturday, September 21, from 12:00 to 5 p.m., the Anderson Center, along with the Red Wing Public Library and Mackin Educational Resources of Burnsville, will host the 14th Annual Celebration of Minnesota Children’s Authors and Illustrators, the state’s premier children’s book festival and one that has received national acclaim for its efforts to promote literacy among young people. 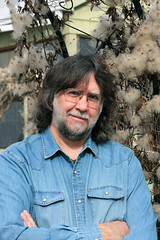 This year’s lineup includes MHS Press authors Bruce Giebink and Bill Johnson (Minnesota Bug Hunt), David LaRochelle (Minnesota’s Hidden Alphabet), and Deborah Jo Larson (One Frozen Lake), who will present with MHS Press managing editor Shannon Pennefeather. As in past years, the event will offer book sales by Mackin Educational Resources, book signings and readings by authors, slide presentations and talks by illustrators, and bookmaking workshops for both children and parents. The Kerlan Collection, one of the finest children’s literature research libraries in the nation, will offer displays of rare manuscripts and illustrations. This exceptional event is free of charge and open to the public. The Anderson Center is located at the intersection of Highways 19 and 61. Details in link, above. It may be snowing in Minnesota, but bugs will be crawling out soon. 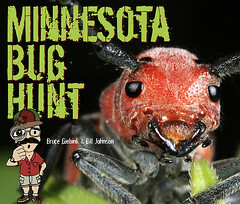 Today we chat with Bruce “the Bug Guy” Giebink and photographer Bill Johnson, collaborators on Minnesota Bug Hunt, a new children’s book about insects big and small, fierce and friendly. Find out why they are both fascinated by the Mantisfly. How did you become interested in bugs? Although I’ve had naturalist tendencies since I was a kid, I wasn’t especially fascinated with insects as a group until I took an introductory entomology course in college. I had no idea of the incredible diversity that exists in the insects. They come in a nearly endless variety of shapes, sizes, and colors, and more species continue to be discovered on a daily basis. Many truly do look like mini alien creatures! Once I began to study them more closely, I started to appreciate their amazing ability to survive and adapt to their environment. As a group, they interact with each other and the environment in some truly amazing ways. One area I find particularly fascinating is how insects interact with each other and plants on a chemical level. Although many insects live in a visual world, even more exist within an amazing world of smells. One of my earliest memories is from around age three or four and I was looking at some hollyhock flowers and saw something fly into one. Being very curious, I walked up to the flower and for some reason stuck my finger in it. Well, the flower bit back. That was a big surprise for me! After a few seconds, I realized that it wasn’t the flower that bit me, but some large insect that quickly flew out of the flower. Later I determined that it was a large bumblebee that had stung me, only because I had just poked it. Because of that, I made it a point to find out what did that and why it did that. To this day, happily, that investigation continues. If you were a bug, what bug would you be? I’d want to be a praying mantis. Mantids are very active and alert predators with excellent vision. They have a very good idea of what’s going on around them. Within the bug world, they are a top predator, so there aren’t many other bugs you’d have to worry about eating you–except perhaps a larger, hungrier mantis! Most can fly, so you’d be able to fly around, just for the sheer joy of flying or to escape danger or to check out different habitats. For an insect, they also live a fairly long time (2.5–4.5 months). How do you get such detailed images? With the right equipment, patience, and practice, it’s really not that hard to do. The best lenses to use are referred to as “macro lenses,” specifically made for close-up photography. When working at such a small scale and subject matter, depth of field is almost nonexistent, so the addition of a flash or multiple flash units is required to achieve sharp detail. What is your favorite cool fact in the book? The crazy life cycle of the Mantisfly. By appearance alone, the Mantisfly definitely qualifies as a bizarre bug! It’s got grabbing front legs (like a praying mantis), a really long neck (about the only other bug I know with a long neck is the Giraffe Beetle, another bizarre bug! ), and beautifully patterned wings (like a lacewing). The life cycle of the Mantisfly is so unusual and detailed that I had a very difficult time keeping the description as short as it is. I wanted to say a LOT more! 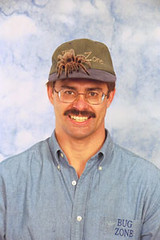 The world of bugs is truly full of weird and wacky characters. The more you look, the more you find. If I had been a part of creating the movie A Bug’s Life you would have seen some REALLY WEIRD and CRAZY bugs, some behaving in a truly WEIRD manner! I like the Mantisfly life cycle story. In the insect world, it’s eat or be eaten, and you do what you can to be successful in one and try to avoid the other. To do that sometimes requires being really sneaky or devious as well as being able to show off bright colors, startling patterns, and weird body shapes. After seeing all the different sizes, shapes, and colors of the insects in this small book, I hope they’ll appreciate the incredible variety or diversity that exists in the world of insects, even in a temperate location like Minnesota and the Upper Midwest. I hope this tiny glimpse into the hidden and mysterious world of insects will pique their interest enough to want to explore their own backyards, woods, and ponds to find their own bugs. Once they find them, I hope they’ll want to learn more about them, such as what they are, what they eat, how they protect themselves, etc. Meet Bruce, Bill, and some bugs tomorrow at Red Balloon in St. Paul at 10:30 a.m. Click on the hyperlink for the title, above, for more events with the authors. 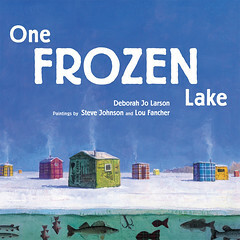 Come check out real ice fishing equipment with author Deb Larson and her husband at Wild Rumpus, play a fishing game, and enjoy hot cider as Deb reads her new book, One Frozen Lake. Then, weather permitting, join her on Lake Harriet for an ice-fishing demonstration after the store event! * Publishers Weekly Starred Review!